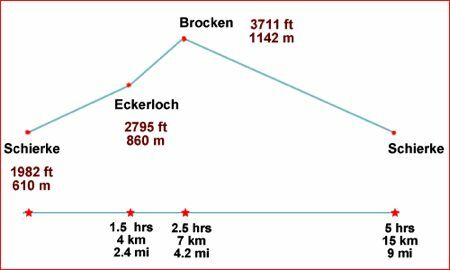 This is a pretty climb from the small village of Schierke, to the top of the Brocken, the highest peak in the Harz. Overall, it's of medium difficulty, but anyone in reasonable shape and with sturdy shoes should be able to do it in about two and one-half hours. There is one short, but steep part where the path climbs up on rocks and wooden planks. Most of it is not strenuous and you are rewarded with beautiful views of forests and rushing mountain streams. Bus from Wernigerode: Bus #257 from Wernigerode will take you there. 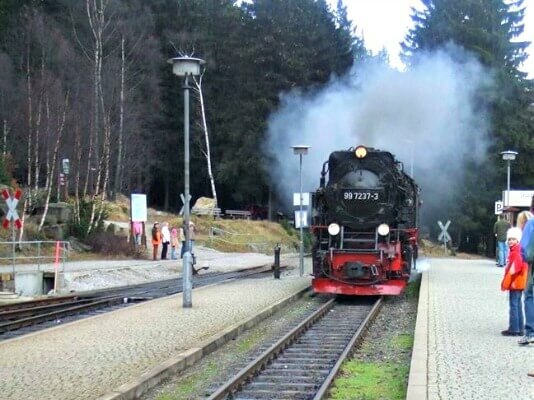 Train from Wernigerode: The Harzquerbahn steam train goes from Wernigerode to Schierke with a change at Drei Annen Hohne. Car from Wernigerode: You can drive up and leave the car in the large parking lot near the Heinrich Heine Hotel in town. The hike starts in the town of Schierke at the Rathaus on the Brockestrasse near the Park Information Center (Nationalpark-Infostelle). The trail follows the Brockenstrasse through the town and out the northern end. The path rises gently and off to the left you'll see the Würmberg mountain. As you enter the Upper Harz (Hochharz) National Park, you'll see an area with an Information Building, Youth Hostel, and a large parking lot with signs for various trails. Stay on the Brockenstrasse, direction "Eckerloch". To the left you'll see the meadow where the river Kalte Bode travels on its way towards the town and is joined by another stream, the Schluftwasser. Both streams arise on the slopes of the Brocken. Shortly after the two streams join, the path leaves the Brockenstrasse and takes a right turn at an old waterworks. From here, the narrow path climbs steeply through a spruce forest alongside the rushing water of the Schluftwasser. 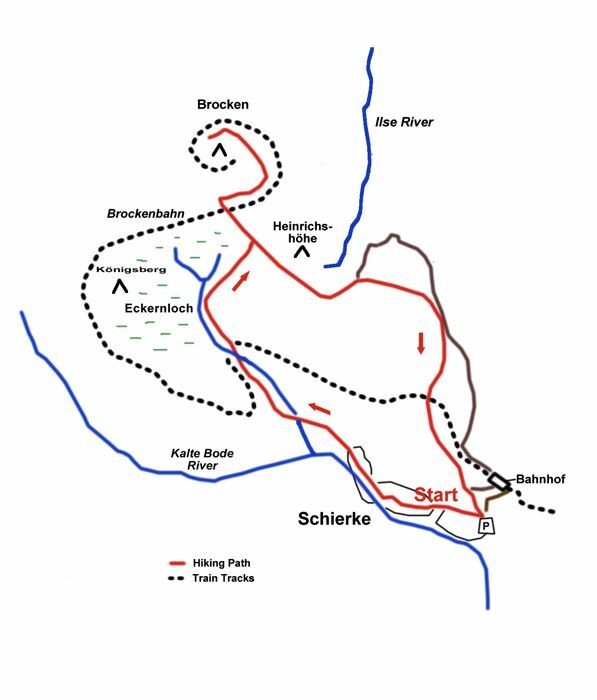 The path crosses the tracks of the Brockenbahn and reaches the Eckerloch rest hut. From here there is a climb upwards and later the Eckerloch path rejoins the Brockenstrasse which takes you past the train station and onto the peak of the Brocken. There is a museum at the top covering the history of the Brocken. You can stop in at the Brockenherberge hotel/restaurant for something to eat and drink before exploring the summit. If you are interested in the plants of the area, there is a botanical garden, the Brockengarten, which has been up here since 1890. There is a path ringing the summit which has some great views of the surrounding Harz (when the weather allows). The Brocken is known to be rather blustery and can be fogged in, only adding to its atmosphere of mystery! The circuit is about one mile (or 1.5 km) around and takes about an hour. Along the way you'll see large boulders with names like the Witches Altar (Hexenalter) and the Devil's Pulpit (Teufelskanzel). Near the radio tower, the Heinrich Heine Trail starts down the mountain towards the town of Ilsenburg. During the Cold War this a was a restricted area occupied by the Warsaw Pact troops. 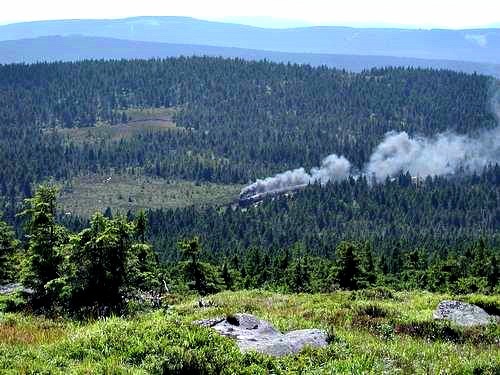 There were listening devices aimed at West Germany, only a few kilometers away, and they were able to monitor radio transmissions far into the west from the high vantage point of the Brocken. The convoy route used by the Border Patrol is still there. You can retrace your steps down or try a different path past the springs that are the source of the Ilse River (see map above). To walk down the alternate route, start down the same way you came up, past the train station in the "Richtung (direction) Schierke". Keep going straight down the slope of the Heinrichshöhe mountain (2nd highest in the Harz) along the Brockenstrasse. When you come to the toilets next to the bulletin board about damaged trees (Waldschädeninfotafel), turn right onto the path marked "Schierke" for a steep shortcut that rejoins the Brockenstrasse below. You'll cross the train tracks once more as you descend into the village. This route takes about two and one-half hours. Make sure you take rain gear unless the weather report is good. The weather on top is wilder than in the towns below. For Harz maps and travel information, see traveling to the Harz. For info on another hike through the beautiful Bode River Gorge in the Harz, see Bode Valley Hike.